JUST SOLD! 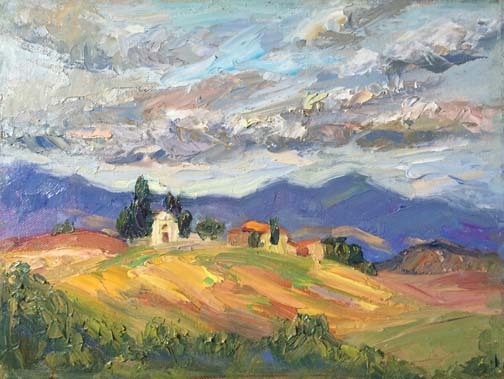 During a recent trip to Tuscany, I set up my easel one afternoon to capture this beautiful view of the distant hills and tiny rustic stone church. With dramatic clouds drifting by creating warm bursts of light on the foreground, a symphony of autumn colors glowed and the white structure popped in the distance. The setting was so peaceful and uplifting that I hope you, too, can slow down and enjoy the calmer pace that Tuscany has to offer. To see more of my travel location paintings, visit nikigulley.com. If you're interested in joining us on one of our upcoming Art Treks or Foodie Treks, please let us know. Spaces fill up quickly! Foodie Trek - Tuscany - Oct. 2019 - Only 1 Spot left!